It's something I haven't done yet. See it a bunch of times. Now, is it of any concern when the cheater snap slides down and reaches the knot on the bottom end of your rig? Are you guys throwing a bead stop on there?also what brand swivels are being run? Are you meaning a free slider or something else? I don't run beads ...should I? maybe... I know some guys do. I think Ive only lost one or two spoons over the years from a coast lock snap opening when it traveled down to the main line swivel. My thoughts are that the bead will affect the action of the main line spoon... as I mentioned, a coastlock snap on one end and a Torpedo swivel on the other (they are nice swivels and aren't going to cost you an arm and a leg) end to the spoon. Just my opinion, am I'm sure there are pleanty of guys out there who do it different with the exact same results... Good luck out there! I guess I distinguish between a cheater and a slider. The traditional cheater is a leader with a spoon on it that is located in a fixed position a few feet above a set of cowbells (used to be called "flashers") and it is long enough so that the spoon angles downward in back of the peanut or cut bait setup so that the fish is attracted to the cowbells and may or may not hit the peanut but then sees the spoon trailing behind it appearing wounded. The slider on the other hand is a short section of mono or fluoro (mine are 8 ft which is 6 inches shorter than my downrigger rods to allow for netting fish) with a swivel snap at either end. I use cheapo swivels for them but ones that have rounded fasteners (e.g. like duolocks in shape)so that the lure can operate freely in them. I use one a size smaller than the other (the end that slides down the main line) so that it can't get by the terminal one (ball bearing swivel) with the main lure on it (if somehow the lure should come off that the slider lure wouldn't also be lost). I roll a few slider leaders up on a section of foam noodle so they are ready to go if tangles occur etc. and with spoons already on them to save time. One of the reasons I use cheapo swivels on the sliders is that over the years I have found that it doesn't make any difference on them and if the line gets tangled (e.g.from excessive speed etc.) it is less expensive if you lose some from cutting. It is the only setup that I use them on ...all others I use solid ring ball bearing swivels. Because I "leader down", my main line has a ball bearing barrel swivel 7' above a duolock snap/lure so the slider will slide down and hang on the barrel and not reach the lure. This has allowed me to cheat a spoon above a flasher. There are little nuances to keep them from getting together. For example, when raising your downriggerball up, catch the cheater with a boat hook before it runs all the way down. 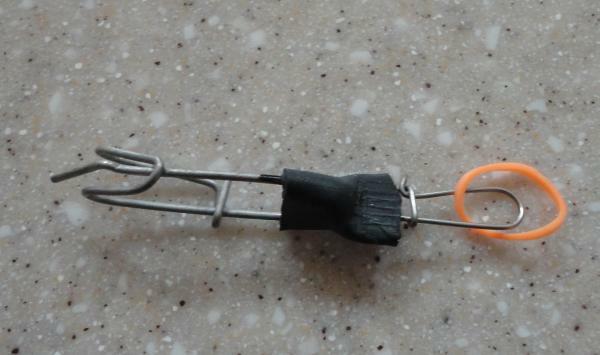 I usually fix my cheaters so I can move my riggers up and down and not worry about getting the two baits together, but if you are running sliders, you really want to start your riggers high and only move them down if needed. Moving a rigger up with a free slider will get the two baits closer than I want. You can have fixed or sliding cheaters. Fixed meaning they are fastened to you fishing line a certain distance above the lower bait. A sliding cheater is simply hooked onto the fishing line and moves down until the bow in your line. Stacked lines refer to multiple poles on the same downrigger almost like a fixed cheater but on another pole instead of being fastened to your main line. In this situation the line of the 2nd pole would be fastened at a set distance above your line of 1st pole. Cheaters are an easy way to get more hooks in the water while tournament fishing without adding more poles resulting in disqualification. I don't see how you could put a swivel inline on your mainline to determine how much higher your cheater will run above your lower bait. Definitely not if its only 7ft from the end of your mainline. Try this visual and see if it helps. Spoon with a snap with a leader to a barrel 7' away. Deploy that spoon however far back from the ball you want. Clip line into release (blacks). Send down the line 8' down and stop your rigger. Now place your cheater on the main line and fix it to the downrigger cable ( for this I use an OR-16 release on the cable and a rubber band to connect to the cheater release. Now send them down to the desired depth. Your rod will fire twice as there are two release points. Much better hook-up ratio compared to a free slider esp. when getting into steelhead or coho that like to head straight up and jump. The red swivel snap is the cheater swivel (minus the mono cheater leader). The mail line runs thru the cheater swivel. I devised what I think is a quite simple setup back in the late 70's and it can be used both as a fixed slider and a stacker. It is basically a clamp used for catfish trot lines (Netcraft?) with a large Duolock snap held on by some heavy duty shrink tubing and a small rubber band. 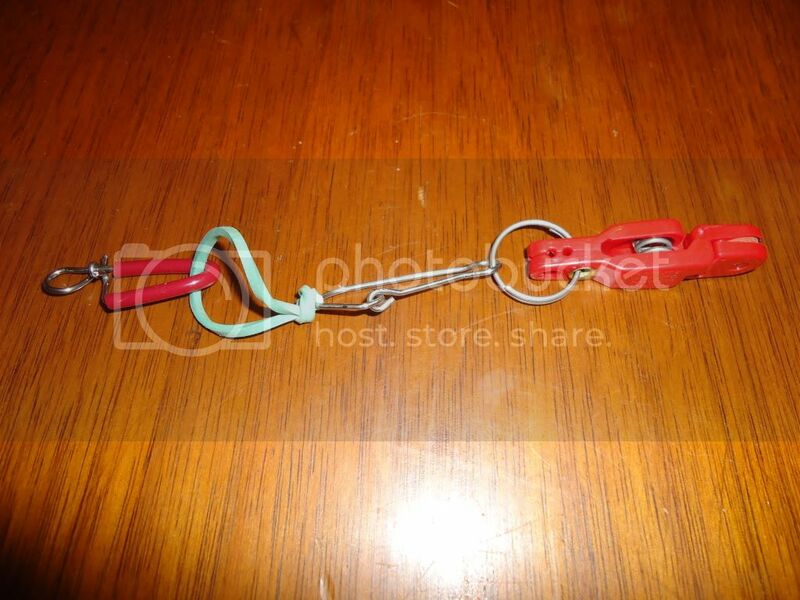 The trotline clamp is clipped or snapped onto the downrigger cable at the desired distanceupfrom the main lure after it is let out and I usually allow 10-15 ft or so above it before snapping it on. The rubber band is placed in the end swivel snap of the slider leader along with the main line and then the other end of the rubberband attached to the duolock snap on the downrigger cable. When the fish hits the fixed slider lure the rubber band breaks and the slider leader becomes free on the main line and unless the fish is real small it usually releases the main line from the Black release as well but if not it can just be manually released. If used as a stacker you just use a half hitch on the rubber band to the line and put the other end in the Duolock snap and clip the trotline clamp wherever you wish on the downrigger cable. The trotline clamp has enough tension to hold yourline on the downrigger cable but when you bring up the weight the clamp will slide and not hang up when it reaches the end of the downrigger. I used to use stackers way back when but once I realized you could get the same or better result using fewer rods (rod limit was 2 per person back then) I switched to the sliders and have caught as many fish over the years (especially rainbows and landlocks) as on the main downrigger lines during the summer months in particular when the thermocline has formed. I prefer the free sliders with small lightweight spoons. If Im Brown trout fishing and they are on the bottom in deeper water, I might pin a cheater on my deep rig. Its interesting when a couple of 10lbers latch on to one rod set up.LOL. Like Sk8man said, the sliders work well when fishing steelhead. The whole idea about sliders is to have one bait in colder water (where Kings tend to lurk in Summer months). then your slider goes out on that same deep rod and, in theory, is in warmer water where Steelhead like to dwell. The thing you need to remember when fishing sliders is: Once the rod fires, leave the rod in the rod holder and reel your a$$ off until you get tight line. I use Diawa Saltist reels because they have a fast retrieval rate and really take the slack up nicely. Just this spring I caught a 15 lb king on a free slider and a 10 lb laker off the rigger spoon simultaneously. Pretty crazy. I always run an 8mm bead above the swivel. Just preference I guess. I run fixed cheater lines every trip out. They make slider snaps that have a hard rubberized coating with a slit in the middle of the snap to attach on mainline that goes to the release. Lately the fish have been hitting the cheater for me and it slides down mainline and pops the release just as if it hit the spoon or whatever I have on my mainline. Sometimes we will forget and just throw it on as a free sliding cheater but another way is to get rubber bands and use those but sometimes they don't snap so it could make a mess of things quickly. x2 what sea-iv said.i believe michigan stinger makes them and fat nancy's carries them.very simple and easy to use. 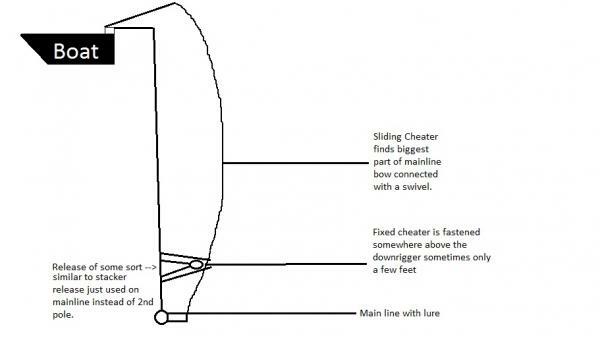 The sliding cheater does just that it moves up and down but once it hits the bow in the line furthest from the downrigger cable it stops so you can figure it's about halfway down the vertical distance. Here i attached a very simple looking photo. It isn't very pretty but gets the point across. In that picture ...would you pinch the snap on the cheater to the mainline WITH the stacker clip? Can the stacker clip put good tension on the snap to hold it in place on the mainline? Not as you would think. Somebody caught on underwater camera that a sliding cheater will eventually end up about 4' above the main line release. It takes awhile to get there and you can follow it down on your fishfinder. The less tension on the rod or heavier main line will effect a greater bow in the line due to drag and the cheater will be more likely to hang out there. Catching steelhead on free sliding cheaters can be exciting. On more than one occasion I saw the fish leap out of the water before noticing the rod thumping. Quite exciting if I may say. What he said. Gets the blood flowing for sure. I run a small clear bead weather its glass( glass is better) or not above the snap on all my rigger rods. I have never had problem with fish opening clips or hampering the action of the spoon. I feel as though the fish don't give s..t.